My roommate read this book in anticipation of the movie coming out in 2 weeks. She told me I had to read it before the movie comes out, so I stopped mid-way through another book I was reading and started. I am HOOKED. I cannot put it down! I read back and forth on the bus each day this week (resulting in motion sickness...) and last night for 2 hours! Cannot, cannot wait to see the movie, and I am dying to continue reading as I write this. I love this feeling... getting so hooked on a book you cannot wait to get to the end of it but secretly wish it will never end because you are so invested in the characters. I haven't felt this way since the I read the Twilight Saga this past winter. 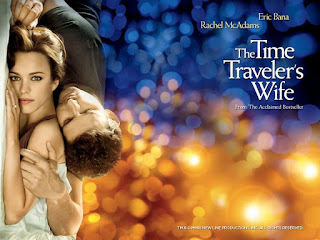 Have you read The Time Traveler's Wife? What books got you so hooked you couldn't put it down? Loved this book and can't wait to see the movie! Wow! I can't wait to read it! At present I'm reading "Pride and Prejudice and Zombies" but now that you've mentioned "The Time Traveler's Wife" I think I'll put it aside!!! I'll add this to my summer reading list -- I guess I have to postpone watching the movie first. I love Rachel McAdams!